The Obligate Scientist: Home birth death toll rising in Colorado? Home birth death toll rising in Colorado? Dr. Amy Tuteur, the Skeptical OB, has a blog post up entitled 'Inexcusable homebirth death toll keeps rising in Colorado.' Now I'm a big fan of science-based medicine (and of Tuteur's blog), however I have to call foul when it comes to that "rising" part of her post. Yes, I think it's pretty minor point since the real comparison to consider is the home birth vs. hospital birth mortality rates - but this is a nice opportunity to do some basic stats. Having left a few comments to that effect on her blog, I figured I would summarize them here. 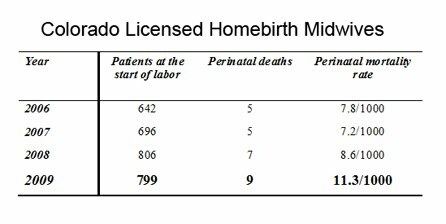 The death toll of homebirth in Colorado is enormous and RISING! To be clear, that's two claims: 1) these numbers are enormous, and 2) these numbers are rising. Clearly the first point is the one we should all be concerned about, not the second which is my focus here. For more details, do read Tuteur's post over at the Skeptical OB and her other posts for links to more data. So what does the data say? Figure 1: Compiled by Tuteur from here and similar sources. Note these are women seeing midwives prior to birth. For example, according to Tuteur the 799 in 2009 comes from "the 639 women who received midwifery care exclusively + the 160 women transferred to the hospital either before or after labor began." So are those numbers rising? 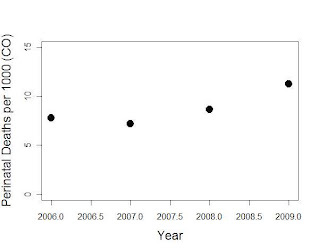 Figure 2: The perinatal mortality rates from above, produced by the script below. Clearly it looks like they are, but how should we interpret them? The answer depends on the question, and here we're interested in primarily one thing: risk. So is this evidence of increasing risk? 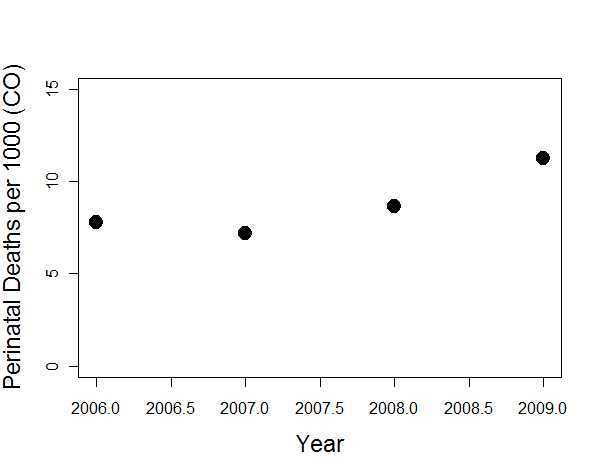 To answer that, lets compare whether or not this apparent increase is real or perhaps just due to "random chance." We can do this quite easily in R (see the script at the bottom of this post) to see if these numbers look statistically different from one another using the chi-squared test chisq.test()in R.
So what does it all mean? We interpret the p-values as the probability that we would see these kinds of differences from chance alone. That is, in both cases it seems a little bit more likely than not that this apparent trend is really just "random chance." Typically we want p-values much closer to zero to rule out chance alone, therefore (statistically) there is no clear increase in perinatal mortality rates. Importantly, this is all based upon (1) just these data and (2) just the chi-squared test. Furthermore "no evidence for an increase" is a different claim than "there is no increase" -- so more data or a better statistical analysis might give a different result. For example, this is a time series and not four independent groups so focusing on their increasing order would require a somewhat different approach. All that said, these large p-values make me doubt a more appropriate statistical test would give any meaningfully different results for these data. The take home message here is that having data like these available allows the public to answer some of these very important questions. Data like these belong in the public arena and organizations like MANA (Midwives Alliance of North America) should be quick to share it instead of keeping it from the public and their critics (as seems to be the case). # Compute perinatal mortality rate. # p near 0 means statistically different, p near 1 means not. chisq.test(rbind(n-pd,pd)); #  <-- corrected version. ?chisq.test ## the help file or this link. Have you ever wondered what exactly they say about science? See photos, transcripts and commentary from my recent trip by Clicking Here.